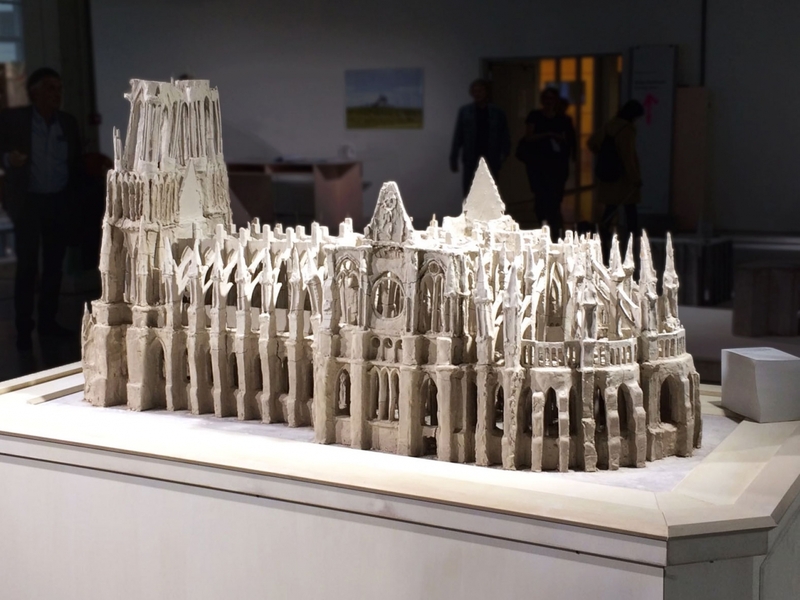 Bart Joachim van Uden and Rick Veugen created a 1:100 scale model of Notre Dame de Reims in clay, reinforced with wood and iron wire, As the last communally created works of art still tangible today, Europe’s great cathedrals are remnants of a time when human values and dreams were perhaps very different from ours. Now a visual artist and a designer are joining forces and working on a project that demands their shared dedication, skills and effort. The Cathedral is broken, the structure is full of cracks and tares, and on the inside parts of the ceiling and a few arches have fallen off and are laying on the cathedral floor. This is not an accident, this was on purpose. "The results of many months of work began to form in our hands. The cathedral began to rise from the table and started to resemble the real Notre Dame more and more. We as the makers both became to dread the point were we would stop keeping the clay wet and let it break and rupture. We were purposely building what would become a ruin but paradoxically we were not making a ruin, we worked as if it was to last forever."